Is It Good? Arcadia #1 Review – AiPT! BOOM! is excited to debut their new series Arcadia this week, created by their up-and-coming talent: writer Alex Paknadel and artist Eric Pfeiffer. This innovative new work is a Matrix-esque take on a futuristic apocalypse scenario where humanity must be digitized in a last ditch effort to save their existence. However, when energy sources continue to dwindle, will it be the few lasting survivors of reality or the millions confined to the virtual realm that have to make a sacrifice? Will this new series live up to its hype? Is it good? Arcadia takes place in the future, years after the world was exposed to a vicious outbreak that claimed billions of lives. To save some semblance of humanity, large quantities of patients’ consciences were streamed into a computer system thus creating the digital realm Arcadia, a place that’s able to expand past the limitations of reality. Now several years into this apocalyptic lifestyle the remaining humans, referred to as “The Meat”, continue to dwindle and are greatly outnumbered by the Arcadian residents. 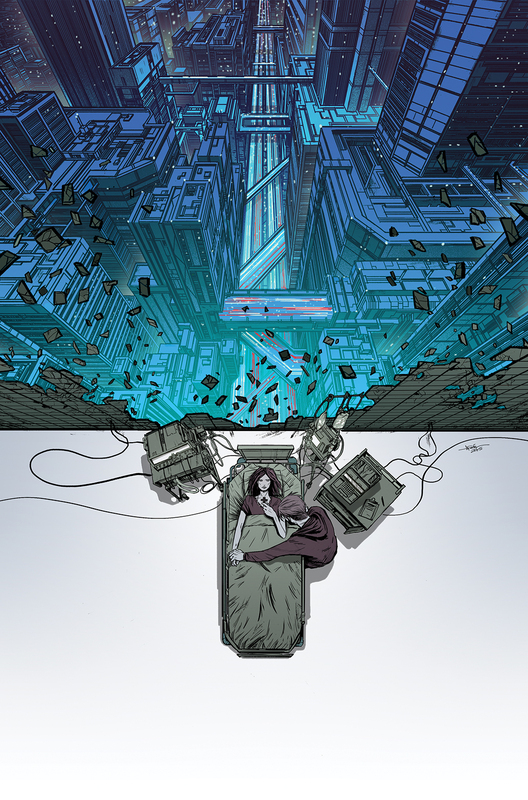 This debut issue describes the current state of the world, teases aspects of this future’s innovations, and sets up the underlying plot for the series. The virus continues to adapt to the researcher’s immunizations and The Meat are dying out. To complicate things, Arcadia is using too much energy with too little contribution to reality so cut-backs must be installed. What those cut-backs entail are up to the President and what her team has in mind. This series has dual storylines, one of the outside world with The Meat and the other focuses in on a family within Arcadia. The central character to this plot is Coral, the angsty daughter of a “well-off” Arcadian family. Her story not only details life within the digital world, but it also shows the transhumanism turmoil that the citizens experience in their virtual afterlife. Despite the population not being able to suffer injuries or die, Arcadia is by no means a utopia. It’s very easy to for comic like this to rely on its conceptual appeal and lack any depth whatsoever. However, Arcadia doesn’t depend on the shock and awe of the central storyline. Paknadel runs with the originality of the plot and integrates complexities such as inner caste systems and multiple conflicts between both the focal story of humanity’s survival as well as the survival of an Arcadian family. Paknadel plays into the concept of the desire for assimilation and the desperate need to feel human which is apparent within Arcadia. In an interview discussing the comic’s conception, Pfeiffler acknowledges his work as being influenced by H.R. Ginger whose biomechanical concepts definitely relate to themes represented in this comic. I really enjoy Pfeiffler’s art although the characters faces sometimes get a bit jowly. Arcadia itself is represented really well, but I would have preferred it depicted with a bit more color to contrast the dark, apocalyptic nature of Alaska, where the system is located. The end is also a bit obscure, but overall this was an excellent and truly creative first issue. Paknadel definitely pulled out a lot of stops for this first issue and let me tell you, it worked. It’s going to be hard to read Arcadia and not be hooked on the series. It shocks you with the creative technological flair and then hits you with some emotionally stimulating material. This is a well-rounded comic and a must have for any sci-fi fan.